Mule deer range throughout Nebraska but mainly located in the western portion of the state. Concentrations occur in and near the Pine Ridge of Northwestern Nebraska and the Wildcat Hills. Not to mention Cheyenne Escarpment in Banner, Morrill and ScottsBluff counties. In addition they are present in the Niobrara River Valley and breaks east to Rock county and over a relatively large area of southwestern Nebraska. Estimates generated by computer predict an average mule deer population of between 35,000 and 40,000 animals each year during the early 1990s. During the first statewide deer season in 1961 hunters took 4,154 mule deer. Since that first season in 1987 they have averaged about 9,800. Large herd die offs over the last several years due to brain worm have occurred. This has prompted Nebraska Game & Parks to implement Mule Deer Conservation Areas (MDCA) to protect the herd and bring them back to their peak. Mule deer are more apt to be found in association with more open upland habitats. Unlike whitetails that thrive in areas of dense cover with good concealment. The classic mule deer habitat is rough, steep canyons sparsely vegetated. Spotted with brushy pockets that carve their way down through open grasslands. Mule deer often bed in plum thickets or other shrubby areas. The Pine Ridge with its rough topography and ponderosa pines is also prime range. Mule deer are less likely to use mature timber along stream courses. But they may frequent timbered areas along the upper reaches of small streams and creeks. Mule deer are also fond of wheat country, clover and sunflower patches. Not to mention small grain and alfalfa crops within their occupied range. The mule deer is a symbol of Nebraska’s western heritage. A native of the prairie, it remains conspicuous among wildlife residents. Locals and visitors alike appreciate its graceful beauty and its adaptability to harsh environments. Hunters spend thousands of hours in their pursuit each year, and in doing so contribute monetarily to local economies. Unfortunately, the mule deer’s fondness for agricultural crops can lead to problems where deer populations are high. Winter concentrations can cause substantial damage to stored crops. Likewise protective measures such as location selection, fencing, and repellents can reduce these losses. Legal harvest, through hunting seasons, continues to be the major tool employed by wildlife managers. 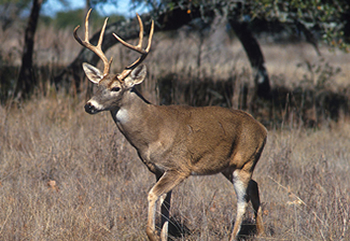 This reduces deer populations to minimize problems suffered by landowners. The white-tailed deer is the most abundant and most widely distributed big game animal in North America. Not only is it the most common species in the Eastern half of Nebraska. But is more abundant than mule deer on some of the western most stream courses. Over most of Nebraska, the best deer habitat is along stream courses and their associated breaks. This prime deer habitat consists of deciduous trees, primarily cottonwood, ash, willow, elm and box elder. Oak and red cedar occur along some drainages, while basswood, walnut and hackberry are found only occasionally. Associated shrubby vegetation includes plum, sumac, chokecherry, buck brush (snowberry or coralberry) wild rose and several other species. River breaks are often characterized by deep gullies and ridges with generally sparse woody growth. Throughout the state, but especially in the east, are thousands of miles of shelterbelts. A combination of hardwood trees, red cedar and shrubs is usually found in these plantings. They are often used by deer for cover. Perhaps only on a seasonal basis if they are located considerable distances from more extensive cover. Woody cover provides the best whitetail habitat, though it is not essential for their survival. Grasslands are suitable where the topography provides concealment. Especially when it is associated with marsh vegetation. Dense areas formerly used as crop producing lands, such as those under long-term retirement programs, have increased whitetail distribution in recent years. Croplands are a reliable year-round food source, and provide a sea of cover from July through October or November. Deer may use croplands for extended periods, but they must retreat to permanent cover for protection from weather and predators after harvest is completed. Whitetails were eliminated from Nebraska by about 1900 due to lack of protection. Return of the whitetails was due to change in attitudes and protection. The recovery has been natural, with only a few deer transplanted to southeast Nebraska in the late 1950s, though some were already present there at the time. Records are limited primarily to hunting seasons – two whitetails were taken near Halsey during the first season in 1945. The entire state was first open for firearm hunting in 1961, when 1,400 whitetails were taken. Harvest gradually increased and since 1987 has been nearly stable at about 28,000 taken annually. In recent years Nebraska’s whitetail population each fall has been estimated at between 150,000 to 180,000 animals. Densities on a year-round basis range from less than five deer per 100 square miles in a few counties to 100 per square mile in a few localized areas. A more important measure is the amount of recreation provided, and in Nebraska hunters spend about 400,000 days hunting for deer each year, and about 300,000 for whitetails alone. On the negative side are the nearly 3,000 deer/car collisions which occur annually. Landowner losses of growing or stored agricultural crops can be substantial, although protective measures such as haystack location, fencing and deer repellents often reduce these to tolerable levels. However, the most effective control is through harvest by hunters.